For quantitative determination of acetylcholinesterase activity and evaluation of acetylcholinesterase inhibitors. ACETYLCHOLINESTERASE (EC 3.1.1.7, AChE), also known as RBC cholinesterase, is found primarily in the blood and neural synapses. Low serum cholinesterase activity may relate to exposure to insecticides or to one of a number of variant genotypes. AChE catalyzes the hydrolysis of the neurotransmitter acetylcholine into choline and acetic acid, a reaction necessary to allow a cholinergic neuron to return to its resting state after activation. Cholinesterase levels of cells and plasma are used as a guide in establishing safety precautions relative to exposure and contact, as well as a guide in determining the need for workers to be removed from areas of contact with the organic phosphate insecticides. Simple, direct and automation-ready procedures for measuring AChE activity are very desirable. 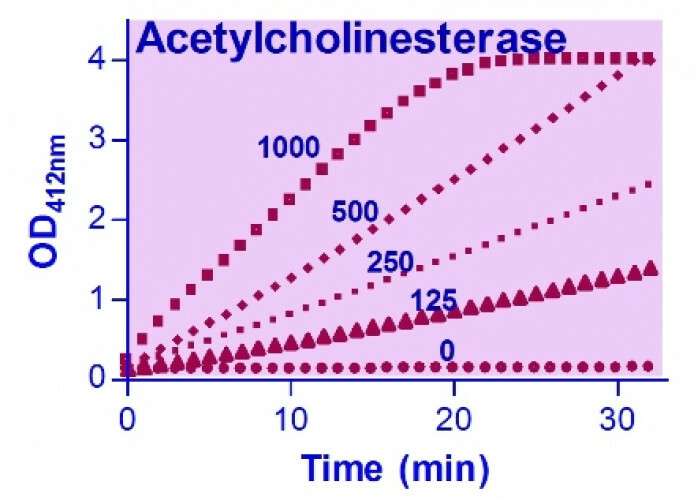 BioAssay Systems’ QuantiChrom™ Acetylcholinesterase Assay is based on an improved Ellman method, in which thiocholine produced by the action of acetylcholinesterase forms a yellow color with 5,5’-dithiobis(2-nitrobenzoic acid). The intensity of the product color, measured at 412 nm, is proportionate to the enzyme activity in the sample. 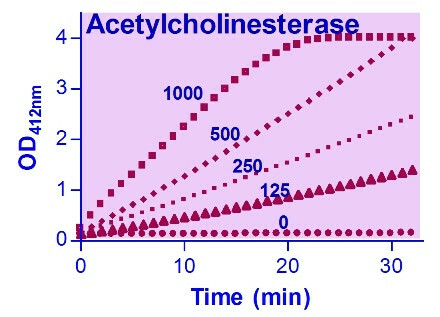 Applications For quantitative determination of acetylcholinesterase activity and evaluation of acetylcholinesterase inhibitors. References Assay: Acetylcholinesterase in Rat cerebral cortical tissues (Pubmed).